Transportation officials captured the first image Thursday of an animal using a new wildlife bridge near Snoqualmie Pass. The new animal overpass is part of a $551 million project to rebuild 15 miles of roadway east of Snoqualmie Pass. The bridge offers animals a safe space to cross the interstate, linking the north and south sides of the road. It was designed to simulate a natural environment that allows animals to cross from one are to another. It has natural vegetation along with high walls to keep the animals from seeing traffic and headlights below. 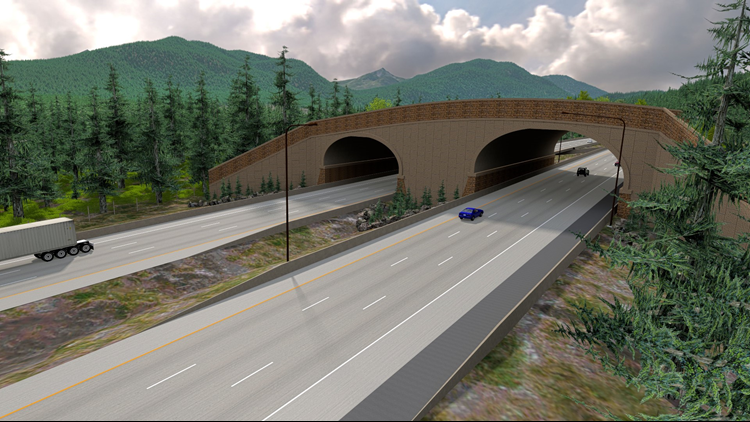 A rendering of the wildlife crossing being built just east of Snoqualmie Pass. WSDOT has said the bridge is a first-of-its-kind project to balance human transportation needs with wildlife habitat. RELATED: Verify: Are animal bridges over major roadways really effective?